A garage attached to the main part of your home may lend itself nicely to finishing the garage attic. Frequently a garage has a large enough footprint to create some fantastic garage attic living space. For example garage attic living space can be used for such things as an in-law apartment, a recreation room, or a home office. If you have a large garage attic space that you are contemplating finishing, there are a number of key items that you need to first consider. I have summarized those items below. - Ingress/Egress – How will you access the garage attic living space, e.g. stairs or a door from the main home? - How much standard headroom height will be able to be created and is it adequate for your needs and local building code requirements? - Natural Light – Attics can be dark and hot places. Where will you add windows and/or skylights? - Will plumbing be required and if so, how will tie into the main home? 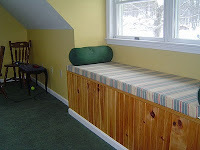 - How will you cool or heat the garage attic space? - Safety – Finishing garage attic space has specific fire and ventilation concerns that will necessitate using drywall in the garage first level, as well in the attic space. In addition you will need to include smoke and carbon monoxide sensors in your plans. If you can properly address these concerns then finishing your garage addition attic space may be an excellent way to gain more living space within your home. For more information on finishing attic space above a garage see my “Room Addition over Garage Bid Sheet”. If you are considering remodeling a bathroom make sure you have a complete bathroom renovation plan in place before starting your demolition. Bathroom remodeling plans mean more than just a set of blueprints or sketches. A complete set of bathroom renovation plans includes a documented sequence of items and events that must happen to successfully complete the bathroom remodel. When kicking off a bathroom remodeling project grab a pad of paper and pencil and write down all of the things you think you need to do to have a successful bathroom renovation project. Then put the pad of paper and pencil aside and come back to it the next day. I guarantee you that over the next day you’ll have several revelations on what else you want to include in your bathroom remodeling project and additional things that must be done in order to complete it. To give you some ideas on what to include in your bathroom remodeling plans I have put together a brief list below. This list is not a comprehensive list, but is a good start to any bathroom remodeling plan. 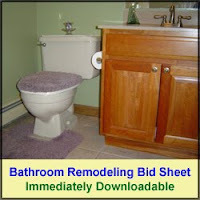 If you would like a more comprehensive set of questions to ask yourself and prospective bathroom remodeling contractors see my Bathroom Remodeling Bid Sheet. Besides a comprehensive questionnaire for contractors to respond to, it also includes tips and advice to the homeowner on how to interpret the contractor responses and what to watch out for in bathroom remodeling contractor bids. This information is extremely valuable in ensuring you hire the right bathroom remodeling contractor. Hiring the wrong one could cost you a fortune in time, money and frustration, not to mention legal battles. In addition to the questionnaire, and tips and advice sections, a separate Excel Cost breakdown spreadsheet is provided to allow you to track your own bathroom remodeling costs. So before you start your bathroom renovation project, develop a complete set of bathroom remodeling plans. You’ll save yourself a great deal of frustration and money, and more likely end up with the bathroom of your dreams. A deck is an extension of your home. It is your home’s outdoor living space and if constructed properly should last many years. Unfortunately, more often than you might imagine, deck construction is performed at a subpar level. In many cases decks are constructed so poorly that they would not meet local building codes if permits had actually been pulled in the first place. Poorly constructed decks also create major safety hazards for your family. When warmer weather arrives, many folks contemplate installing a deck or evaluating their deck for replacement. Before you hire any old deck installation contractor however, make sure you’ve done your homework on them first. Check their references and make sure they have insurance. Also see how long they’ve been in business. You don’t want to hire the deck installation contractor that just picked up a hammer for the first time. It is also important to have a good idea of what you are looking for in a new deck and what type of materials you want to use. Composite decking materials look fantastic and are low maintenance, but they cost a pretty penny. Pressure treated decking material is relatively inexpensive but it can warp, twist and fade out in just a couple of years. 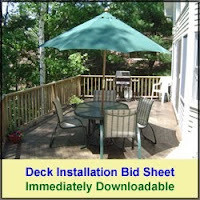 To learn more about hiring a deck contractor and installing a deck see my “Deck Installation Bid Sheet”. I guarantee you that you’ll save money and get the deck you’re looking for by using this product. A neighbor of mine had their roof re-shingled last week. They went with a large home improvement box store for having their roof re-shingled, so they thought all would go well. Unfortunately it did not. The shingles arrived on the jobsite a day before the roofers showed up, which was all well in good. The problem occurred the next day when the roofing crew began installing the new shingles. They were about halfway up the first roof slope with the new shingles when my neighbor stepped out to see how they were progressing. Much to her surprise, the shingles were not the same color she had ordered. She called the home improvement center to let them know about the mess up, and their response was “So how do you like the color?” and “Can you live with them?”. The store manager also said that he would give her a $100 coupon to use in the store if she stuck with them. This said, she had a contract that specifically called out for a certain color of shingle, and her response was “are you kidding”. After further phone calls and uncomfortable discussions, my neighbor decided to stick with the wrong color shingles, and the home improvement center has significantly increased the number of dollars associated with the coupon. Needless to say, neither is very happy. This entire issue could have been avoided if my neighbor had checked the shingles before the roofing crew showed up. Now she has to permanently be reminded of the mistake every time she rolls into her driveway and sees her roof. Some may ask why the homeowner needs to explicitly check the roofing supplies. And it is a valid question. Unfortunately my answer is disappointing. When it comes to home remodeling contractors it is wise to regularly check up on them. In their defense, sometimes the problems are not always their fault. Sometimes it’s the homeowner or poor communication between the two. In this particular situation it was the home improvement center that made the mistake. They were simply installing the shingles that had been delivered to the job site. So before the roofers show up on your roof to install new shingles, make sure to check the roofing materials first. I would also suggest using my Asphalt Shingle Roofing Bid Sheet. This bid sheet helps prevent the type of situation my neighbor found herself in. When it comes to framing a roof you have two basic choices, framing with trusses or stick framing. Both offer advantages and disadvantages. Truss roof framing offers several advantages. First it is significantly cheaper. Since roof trusses are fabricated at a manufacturing facility fewer carpenters are needed on the jobsite. In addition, assembling roof trusses on a home goes much quicker than stick building a roof. Also, roof trusses, for the same size roof, typically use less lumber material than stick built roofs. Finally, truss roof framing eliminates waste and mess on the job site, thus saving money on jobsite cleanup as well as in scrap material costs. One downside of using roof trusses is that they are not conducive to creating useable attic space. Typically roof trusses have interior web members between their top and bottom chords which inhibits open attic space. Another issue with truss roof framing is that it does not necessarily work well for complicated roof lines that may include dormers and cathedral ceilings. Also, typically a crane is required to lift and position roof trusses into place. Stick framed roofing offers the advantage of constructing complex roof lines, such as roofs that include dormers and cathedral ceilings. In addition, stick framed roofs typically enable more open attic spaces. The main downside associated with stick framed roofs is that they cost more to build. More skilled carpentry labor and time is required on the jobsite and typically there is more waste material. This past weekend I broke down and bought a John Deere Utility Trailer to complement my John Deere X304 tractor lawnmower that I had purchased last fall. I had been debating purchasing the utility trailer for months. However, this past weekend I finally broke down and purchased one. The tipping point for me was that I had to spread 5 yards of mulch, and when I pulled out my wheelbarrow and could not inflate the tubeless tire I said enough. I must have taken 2 or 3 different wheelbarrow tires down to the garage to have them pumped up over the past couple of years and I was fed up with it. I never remember having so many problems with wheelbarrow tires in decades ago. These new tubeless tires appear to be junk. Anyways, I digress. After spending about an hour putting together the John Deere utility trailer I put it right to use. It holds 10 cubic feet and really helped to speed up the mulch spreading project. John Deere also sells a 17 cubic foot utility trailer, but I found the 10 cubic foot one to be more than adequate. What I really liked about my new utility trailer was the fact that it had an easy tipping mechanism to allow me to dump the mulch. The only gripe I had with the utility trailer was that the tongue bent the back tractor hitch plate. With the X304 it has 4 will turning. Consequently you can make some really tight turns. Apparently the turns were a little too tight for the utility trailer. The utility trailer tongue pinched the sides of the tractor trailer hitch plate and caused some minor twists in the metal. Other than that one problem, I am very happy with my new John Deere Utility Trailer purchase. I’ll just make sure I keep my turns a little wider going forward. If your basement has a regular water problem your only solution maybe to install a basement sump pump. To install a basement sump pump properly it should be located in the lowest area of the basement. A hole should be punched through the basement floor and the sump pump mounted down into it. The installation of a sump pump can easily set you back over a $1000 if installed by a professional. Besides the installation of the sump pump, a GFCI electrical outlet may need to be installed near it. In addition, if your basement requires the need for a sump pump you should also consider installing a portable backup generator. When sump pumps are needed the most, e.g. during heavy rain storms, the threat of a power outage is heighted. Heavy rain and winds, loss of electricity, and an inoperable sump pump due to the lack of a backup generator is a certifiable recipe for a flooded basement. Lighting is often an afterthought in many home improvement projects. However lighting plays an important role in setting the mood and ambiance in a room. Consequently lighting should be near the top of the list in any home improvement or remodeling project. One type of lighting to consider when developing your lighting plans is stair lights. Stair lighting, which is normally located in the walls just adjacent to the stair treads, or integrated into the stair treads themselves, provides both functional and aesthetic purpose. Stair lighting is idea for stairways that have limited to no natural light. Stairs to a finished basement, for example, are a prime candidate for stair lighting. Likewise stairways to attics are also candidates. Stair lights are typically recessed light fixtures that sit flush with the finished walls, and are located usually just a few inches above the level of the stair treads. In some cases they are installed adjacent to every stair tread and in other cases every other stair tread. So if you have plans of finishing a basement or attic don’t forget the lighting and think about adding some stair lighting to provide some unique charm to your home improvement project. The deadline for the homebuyer tax credit is nearly upon us. This program started by the federal government was another tool in stimulating the economy. The homebuyer tax credit provides up to an $8,000 credit for home buyers who have not owned a home in at least three years. In addition, the homebuyer tax credit is also targeted towards some current homeowners. The federal government is also offering up to a $6,500 tax credit for those who have currently lived in their own home for at least 5 consecutive years and want to move. The deadline to participate in this government handout ends soon. Contracts must be signed by May 1, 2010 and closings need to occur before July 1, 2010. So if you are considering jumping into the housing market for the first time, or have a desire to move from your existing home, and have lived in it for the past 5 years, you should make your move now. All the homebuyer stars are in alignment; low interest rates, low house prices and government tax credits. This is most likely a once in a lifetime deal! The familiar phrase often repeated in early spring that goes like this: “April showers bring May flowers” should be amended to include a reference to cleaning gutters. With heavy spring rains it is a wise idea to clean out the gutters as soon as there is a hint of above freezing temperatures. Leaves and tree branches that may have fallen into the gutters can cause them to clog up. With heavy spring rains, un-cleaned gutters can overflow their side walls and spill roof rain water where it has not been designed or desired to go. So make cleaning gutters in early spring an annual ritual and let the “April showers bring May flowers” phrase be a siren call as a reminder to clean your gutters. If you look closely at a where a chimney abuts a roof you will notice stepped metal climbing up from the roof and onto the chimney wall. That metal is referred to as chimney flashing and it is used to create a leak free seal between the chimney and the shingled roof. Chimney flashing is installed when the roof is shingled. Chimney flashing consists of small sheets of metal that are formed and interwoven underneath the shingles near the chimney and slightly up the side of the chimney. To attach the chimney flashing to the chimney brick mortar properly the brick mortar is removed and the chimney flashing is slid into the seam and slightly up the back side of the chimney wall. Finally the chimney flashing seams are cemented and a bead of polyurethane caulk is applied to seal the flashing into the brick mortar seam. Chimney flashing is available in a variety of metals including lead, copper, tin coated steel, and galvanized steel, and sometimes aluminum (however aluminum should not be used). All of the metals, with the exception of aluminum, can easily be soldered, brazed, or welded to create leak free seams. They are also used due to their ability to be easily formed to the contours of the roof and chimney wall. See my Asphalt Roofing Bid Sheet if you are looking to have your roof reshingled and the chimney flashed. In many cases it makes more sense to restore a door to its original beauty than to throw it out. Though there is some work required in a door restoration project, there is nearly as much in replacing a door. As a matter of fact, replacing a door can involve more as the existing doorframe frequently needs to be removed and replaced. Solid wood door restoration begins with an orbital sander and some 60 grit sandpaper. Sand all of the flat surface areas of the door including the raised panels and the door rails and stiles. Sand the door down to bare wood. Next, using 60 grit sandpaper and/or a foam sand block sand all the corners of the door, in the raised panel area. Repeat the process again, but use 120 grit sandpaper instead to achieve a smooth finish. Once you have completed sanding the door wipe it down thoroughly with a rag to remove any dust. Then apply a single coat of a pre-stain to it to ensure an even application of stain. Wipe any excess pre-stain off after 5 minutes. Next, apply a single coat of stain to the door. Again, after applying the stain wait a few minutes and remove any excess with a rag. I find a foam brush works best for actually applying the stain. After the stain has fully dried apply two coats of polyurethane to the door. Make sure you allow the polyurethane to fully dry between coats, and lightly wipe down the door with fine steel wool prior to applying the second coat of polyurethane. Also, make sure to wipe the door down with a dry rag after using the steel wool on it and before applying the second coat of polyurethane. For the final step apply a coat of butchers wax over the door. This will help to create a smooth and silky finish. To learn more on door restoration see the below video where I show and discuss how to do a door restoration project. Every year thousands of children are injured by falls from windows. You can help prevent your child from becoming a statistic by taking a few simple safety precautions with your home’s windows. First, it is important to understand that window screens are meant for providing ventilation and preventing insects from entering your home. They are NOT meant for preventing falls. To childproof your windows and prevent falls, do not place your children’s bed and furniture near windows. Also, when you do open a window, such as a double hung window, lower the upper sash versus raising the lower one. By lowering the upper sash it makes it more difficult for the child to reach the open window. Another great idea is to consider installing window guard devices on the windows to prevent accidental falls. Also, keep your windows closed and locked when not home or ventilation is not required. Finally, to prevent accidental hangings only use window blinds or window treatments that do not have loose cords. Installing window blinds is a great way to keep your home feeling cooler during the summer months and warmer during the cold ones. By installing window blinds you can help to reduce cold air drafts and provide some extra window insulation in your home. Window blinds are also great for blocking out early morning or late afternoon sunlight when the sun is low on the horizon. Window blind installation is a breeze and typically requires only a screw driver or a hammer. Window blinds also come in a wide assortment of types and sizes, so there is no limit to your choices. There are both vertical and horizontal window shades, as well as vinyl roll up window blinds that simply roll up or pull down with a gentle tug. Window blinds also require little maintenance. Simply wipe them down occasionally with a duster or damp cloth and that’s about it. Window blinds vary in price, however in general they are quite inexpensive, particularly when you consider their home energy savings. With Spring well underway it’s now time to get the lawnmower out and perform some basic lawnmower maintenance. This list of basic lawnmower maintenance tips can make your lawnmower purr this summer season. Clean Spark Plugs – Fouled spark plugs can make an engine run rough or not at all. Clean Lawnmower Carburetor – A dirty carburetor can cause you engine to run rough or not at all. Tighten Wheel and Handle bolts – Loose nuts and bolts can cause lawnmower handles and wheels to fall off. According to a recent 2010 National Association of Realtors (NAR) survey, vacation home sales were up 7.9% in 2009 to 10% of all home sales. Investment home sales, on the other hand, were down 15.9% in 2009 to 17% of all home sales. The 2009 medium sale price for vacation homes and investment homes was $169,000 and $105,000, respectively. A vacation home is defined as a property where the buyers intend to use it more than rent it, whereas an investment property, is expected to be used less by the buyer and is typically rented out. Could this be another early sign of a housing recovery. Possibly. According to the NAR report the average age of a second home buyer is in his or her 40s. Though the baby boomer generation is getting long in the tooth, there are 44.4 million people in the 40-49 age bracket, whereas there are only 40.1 million boomers in the 50-59 age bracket. With historically low housing prices and a larger buying pool than selling pool, the time may be ripe for purchasing a second home.